Notes: Castle is in dedicated park within the town centre. Ample town parking available within a short walk of the castle. The extensive remains of the Keep along with limited remains of the gatehouse and bailey curtain wall and turrets. Castle is managed by Harrogate Council. 1. Knaresborough Castle was the refuge for Hugh de Moreville, Reginald FitzUrse, William de Tracy and Richard le Breton after their assassination of Thomas Becket, Archbishop of Canterbury, in 1170. Having gained infamy as the refuge of the assassins of Thomas Beckett Archbishop of Canterbury, Knaresborough Castle was heavily modified throughout the medieval era to become a formidable Royal fortress. Besieged in the Civil War it withstood a six month siege before falling. 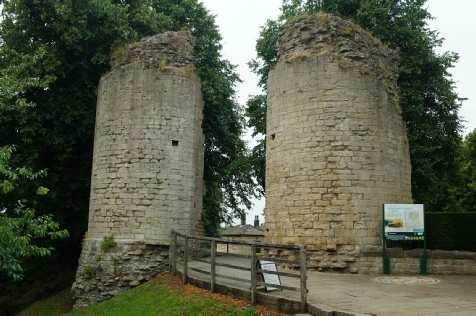 Although a motte-and-bailey castle probably existed at Knaresborough in the years following the Norman Conquest, the first known record is of a castle built no later than 1130. Situated high on a cliff over looking the River Nidd it was regarded by the Norman rulers as a key northern fortress resulting in major upgrades throughout the medieval period; King John made substantial modifications in 1205, Edward I in 1307 and Edward II built the Keep in 1312. Edward III then granted the castle to his wife, Queen Phillipa, as a wedding present and in 1372 it was granted to her son, John of Gaunt, becoming part of the Duchy of Lancaster and, through his son Henry Bolingbroke (later Henry IV), became a Royal Castle once again. Knaresborough briefly played a part in Henry's transition to King - the recently deposed Richard II spent one night at the castle before being moved onto Pontefract where he died under suspicious circumstances. The castle saw action during the Civil War where it was garrisoned for the King. As Royalist fortunes in the north waned after the defeat at Marston Moor, Knaresborough became increasingly isolated. The Royalists here mounted an attempt to relieve Helmsley Castle but failed and Knaresborough itself was under siege soon after. After six months an honourable surrender was agreed but Parliament ordered the demolition of the castle to prevent re-use.